A PENNILESS FREELANCE JOURNALIST selling articles here and there in 1941, Gabrielle Roy lived a marginal existence in a rooming house on Dorchester Street, near Greene Avenue. "For human warmth," she told Donald Cameron many years later,"I used to roam the streets, walk and walk and walk." "I used to choose as the goal of my walks," she said elsewhere, "the pretty avenues of Westmount and the slope of the mountain. One day, by pure chance, by caprice if you will, I instead went south on rue Saint-Ambroise and found myself before I knew it in the very heart of Saint-Henri. What can I say? How can I give you the deep impression I suddenly received? It was like the lightning that strikes lovers; it was a revelation, an illumination." Gabrielle Roy (1909-83) was so convinced that a novel set in the working class world of Saint-Henri was crying out to be written that she feared someone else would get there before her. Though Bonheur d'occasion (later translated as The Tin Flute) would not be published until 1945, Roy began immediately to bring the district to life in a series of articles for one of her freelance markets, the Bulletin des agriculteurs, a farm publication. Bonheur d'occasion would go on to sell over a million copies, win a Governor General's Award and become a Literary Guild of America selection. It made of Roy the first Canadian winner of the prestigious French Prix Fémina and a recipient of the Lorne Pierce Medal of the Royal Society of Canada. (She subsequently won many other awards including two more Governor General's prizes.) Critics have judged it a landmark in the development of the contemporary Québécois novel because of its innovative subject matter (the grittiness of urban life) and its freshness of language?Roy's use of joual, "le langage canayen." 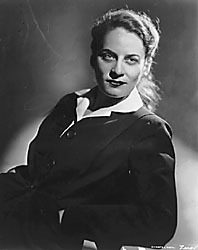 Yet Gabrielle Roy, though passionate in her love of Montreal and Quebec, was a latecomer to the province and never felt comfortable with the label of Québécoise, French-Canadian or even Canadian writer. Once she had committed herself to a writing career, she set out to make a world class reputation for herself, just as, she wrote in her autobiography, she yearned for her home to be "the whole world and all mankind." Roy was the youngest of eleven children (eight of whom survived to adulthood) born in St. Boniface, Manitoba to an impoverished couple who had moved there from Quebec. She was very close to her mother who nourished her from infancy on stories of the Quebec homeland. Roy experienced at an early age the petty and not-so-petty humiliations of being francophone on the prairies. Yet she became so completely bilingual that at one point she considered making English her language of composition. In the end, she wrote in French but all her books were translated almost immediately into English and she achieved wide recognition throughout the English speaking world as well as in France and Quebec. Her reputation suffered in Quebec towards the end of her life because of her refusal to become politically engaged on the side of indépendantisme. In a 1971 interview she said,"My great hope would be that Quebec would realize itself fully as a distinct part of Canada, and stay Canadian, bringing to Canada a part of its richness ." Beyond that she maintained, "The main engagement of the writer is towards truthfulness; therefore he must keep his mind and his judgement free." Roy's breadth of vision was born under the limitless prairie sky that she loved, then left at the age of twenty-eight, after having taught school for eight years in Manitoba. She travelled to England (where she at first thought to make an actress of herself) and France in the late 1930s, tasting the magic of Europe and the pain of a broken love affair. She found her vocation as a novelist when she returned to Canada in 1939 and began writing Bonheur d'occasion in Montreal. After its publication, she married a physician from St. Boniface, Dr. Marcel Carbotte, and went abroad for another three years. She subsequently settled in Quebec City and wrote some sixteen books: novels, short stories, children's books, a collection of essays, and an exquisite autobiography, Enchantment and Sorrow. Bonheur d'occasion, a work notable for its naturalism and its tone of somber social desperation, was followed in 1950 by La Petite poule d'eau (Where Nests the Water Hen), a pastoral novel set in an idyllic and isolated rural community in Northern Manitoba where Roy had once taught school for a summer. Such dramatic shifts of setting and subject matter became typical of her career which swung between two modes of vision, what the critic Hugo McPherson has-called "the world of experience and the world of innocence." Particularly adept in the portrayal of strong female characters, she cannot be classified under any particular rubric. She wrote with compassion about Doukhobor, Ukrainian and Chinese immigrants, of Winnipeg slums and about the Arctic, of the clash of cultures between Inuits and whites, of an inhibited bank teller dying a slow death in Montreal. Mark Abley cut to the heart of her talent when he wrote in Maclean's magazine, "Only a few modern writers, notably Isaac Bashevis Singer, could match her gift of portraying warmth without sentimentality, joy without delusion. Even when her work described alienation and loneliness, it also reached out in hope." Excerpt from Gabrielle Roy's Bonheur d'occasion, translated by Hannah Josephson as The Tin Flute, (Toronto: McClelland & Stewart, 1947), 25-26. The street was absolutely silent. There is nothing more peaceful than St. Ambroise Street on a winter night. From time to time a figure slips by, as if drawn to the feeble glimmer of a store front. A door opens, a square of light appears on the snow covered street, and a voice rings out in the distance. The passerby is swallowed up, the door bangs shut, and only the spirit of the night reigns in the deserted street between the pale glow of lighted windows on one side and the dark walls bordering the canal on the other. At one time the suburb had ended here; the last houses of Saint-Henri looked out on open fields, a limpid, bucolic air clinging to their eaves and tiny gardens. Of the good old days nothing is left now on St. Ambroise Street but two or three great trees that still thrust their roots down under the cement sidewalk. Mills, grain elevators, warehouses have sprung up in solid blocks in front of the wooden houses, robbing them of the breezes from the country, stifling them slowly. The houses are still there with their wrought-iron balconies and quiet facades. Sometimes music penetrates the closed shutters, breaking the silence hike a voice from another era. They are lost islands to which the winds bear messages from all the continents, for the night is never too cold to carry over alien scents from the warehouses: smells of ground corn, cereals, rancid oil, molasses, peanuts, wheat dust and resinous pine. Jean had chosen this remote, little-known street because the rent was low, and because the deep rumble of the quarter, the whistle blowing at the end of day, and the throbbing silence of the night spurred him on to work. In the spring, to be sure, the nights ceased to be quiet. As soon as the channel was free of ice the sirens blew from sunset to dawn, echoing from the bottom of St. Ambroise Street over the entire suburb, and even as far as Mont-Royal when the wind blew that way. Bonheur d'occasion (Montreal: Société des Éditions Pascal, 1945), translated by Hannah Josephson as The Tin Flute, (Toronto: McClelland & Stewart, 1947). La Petite poule d'eau (Montreal: Beauchemin, 1950), translated by Harry Lorin Binsse as Where Nests the Water Hen (Toronto: McClelland & Stewart, 1952) . Alexandre Chenevert (Montreal: Beauchemin, 1954), translated by Harry Lorirt Binsse as The Cashier (Toronto: McClelland & Stewart, 1955). La Route d'Altamont (Montreal: HMH, 1966), translated by Joyce Marshall as The Road Past Altamont (Toronto: McClelland & Stewart, 1966). Ces Enfants de ma vie (Montreal: Stanké, 1977), translated by Alan Brown as Children of My Heart (Toronto: McClelland & Stewart, 1979). La Detresse et l'enchantement (Montreal: Boréal Express, t984), translated by Patricia Claxton as Enchantment and Sorrow: The Autobiography of Gabrielle Roy (Toronto: Lester & Orpen Dennys, 1987).